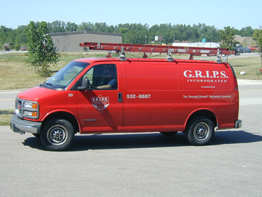 "saving the world one control at a time"
G.R.I.P.S., Inc. is a certified expert service office for commercial applications of the Carrier i-Vu System. The Carrier i-Vu System combines state-of-the-art Carrier equipment and the powerful, web-based i-Vu user interface to deliver comfort and energy efficiency in constant volume systems, variable volume/variable temperature (VVT®) systems, and packaged variable air volume (PVAV) systems. i-Vu intelligently interprets building conditions and optimizes equipment operation, providing up to 32 zones for VVT applications and up to 128 for PVAV applications. Carrier i-Vu System controls allows you to monitor and control your building HVAC systems from your computer. You can even set your system up to be able to access and monitor your building from anywhere you are with access to a computer. Do you want to control building lighting? i-Vu can also be tied into your lighting systems and control all aspects of lighting for your facility including the parking lot. Building control systems gives you the owner the power to control your facility HVAC and lighting systems at a glance. This allows you to maximize the efficiency of your systems to reduce energy cost. Contact us today to see a demonstration of this powerful controls system today. The Carrier Controls Expert Program consists of service providers who's expertise is second to none through their commitment to product and systems education. A service provider can only be listed on this page after their technicians have devoted many hours to classroom and hands on training with carrier controls. Their training requirements continue year after year as they are required to annually renew for each tier of certification they hold.